About 10 minutes boat ride from Sipadan Island and 5 minutes Mabul Island is the beautiful Kapalai water village resort. It’s built on wooden stilts by a small sand bank known as the Ligitan reefs. Divers stay here to have access to Sipadan island, but there is a marine wonderland literally underneath their feet. Stingrays, squid, lionfish and trumpet fish can be seen from the bungalow balconies. However to see the real wonders requires donning scuba gear and getting wet. Currents are mild at Kapalai and visibility is usually better than at neighbouring Mabul Island. With a maximum depth of 20m the dive sites here are suitable for beginner divers but will probably appeal more to more experienced muck diving enthusiasts. Divers staying at a Mabul Island resort will get a chance to dive Kapalai reefs during their stay and vise versa. The dive sites at Kapalai and Mabul are very similar. One of the most popular dives is just off the resort jetty. It’s so easy just to jump off the jetty onto the reef and divers staying at Kapalai resort can do as many dives here as they wish. It’s also a good spot for night dives and also for snorkellers. On the reef here it’s possible to see leaf fish, scorpionfish, lionfish and ghost pipefish. Seahorse can also be found along with many nudibranchs. One of the highlights of the jetty is to dive it at dusk and watch for mating mandarin fish. These beautiful little fish are normally hidden down in the coral rubble but get frisky as the sun goes down and rise of the bottom to mate in mid water before darting pack down to their shelters, a truly awesome spectacle to witness. Mandarin Valley is a gently sloping coral reef that descends down to 20m. At the bottom of the reef cuttlefish are often seen near an old fishing boat wreck. On the hard coral reef moray eels and scorpionfish can be found plus some small reef fish. Frogfish and leafy scorpionfish can be seen here, both excellently camouflaged amongst coral and sponge. Pipe fish are present as on most Kapalai reefs and seahorses can often be spotted. Nudibranchs are numerous. Occasionally reef sharks come into the reef. 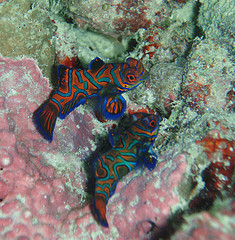 However the main stars of this dive site are the mandarin fish which dance among the coral displaying their vibrant colours. This dive site is one of the most reliable dive sites to spot them, not always easy as they are just a few centimetres long. kapalai divingMandarin fish mate around dusk time so a nice dive is to jump in just before dusk to witness the mating and then finish the dive as a night dive. At night a myriad of shrimps and other crustaceans can be found. If you drift slowly southwards from Mandarin Valley you will come to a small dive site called Cleaning Station which is home to lots of colourful nudibranchs and seaslugs as well as hermit crabs and other crustaceans. All the same critters can be found at Ray Channel, another popular Kapalai dive site. Maximum depth here is 20m and currents are weak. Frogfish, leaf scorpionfish, pipefish and so on are all present but the main draw is a pair of pegasus sea moths (dragonfish) that inhabit the bottom here. These crazy looking specimen are quite rare and a sighting is a real treat for any serious muck diver.